Brothers Danny and Chris Puskar’s foray into the brake industry started in 2003 where they, along with their father, built a brake pad company. After 10+ years of building the business and gaining experience in the brake industry, they moved onto building G-Loc. Long story short, G-Loc Brakes became the new company that formed out of Danny and Chris’ combined experience in the brake industry, and with both brothers firmly at the helm, they are now able to spread their wings like never before. G-Loc Brakes are created using “proprietary Carbon, Ceramic, Kevlar, and Metallic compound formulations”. G-Loc prides themselves in using brakes that are rotor-friendly along with providing great stopping power confident braking modulation and release characteristics. In addition to the 8 brake pad compounds currently available, G-Loc also has options to satisfy your custom needs. Our SpeedSF racing drivers have had fantastic results with G-Loc brakes. 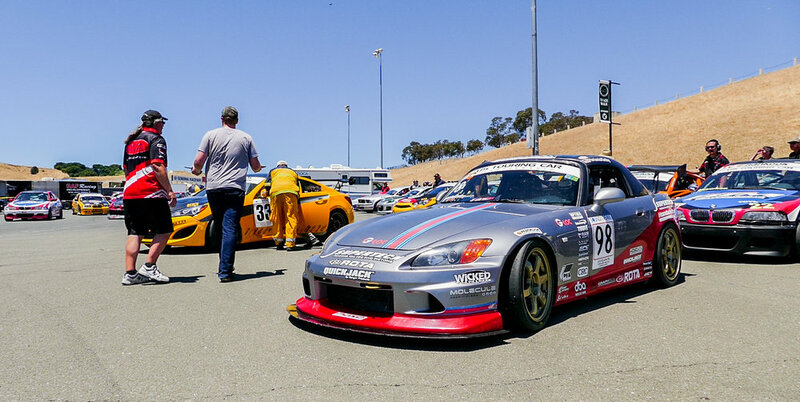 Patrick Chio and his 350Z placed 2nd in his USTCC class while Andrie Hartanto and his Honda S2000 placed 1st in his class. Specifically, their use of the G-Loc R10 and G-Loc R12 braking compounds delivered fantastic results during their racing season and these are two compounds that will be looked at more in-depth. Starting with the R10, its highlights include a very strong initial bite and high coefficient of friction. Along with the quality smooth release, modulation, and rotor-friendliness, it boasts a wide operating range, which begins at 118° F and its fade resistance is in excess of 1475° F.
The R12, which is levels above the R10, increases the excellent initial bite, along with a higher coefficient over the R10. While it is still rotor-friendly, it does have a bit more aggression over the R10. The operating range for this begins at 173° F and its fade resistance is in excess of 1860° F.
The main thing you will need to understand for your own needs are that figuring out what works best for your car and car's setup. Driver Andrie Hartanto states, "G-Loc has been a long-time supporter of my racing effort. Together, we’ve won a few titles, recently, the 2017 USTCC title. Their brake pads are a major contributor to this affect. We would have not been able to do it without them. Their ease of modulation has allowed me to out-brake my competitors." Our SpeedSF instructor, Scott Smith enjoys his G-loc brakes, saying, "I use G-LOC Brakes. Period. If G-LOC makes a pad for my car, that’s what I use. I had never used them on a Spec Miata before, but only because I never had a Spec Miata. My 1999 Miata track car uses the standard R10/R8 combo with great success. The Spec Miata is a little heavier and has less horsepower, but pedal feel and modulation were still exceptional, not a hint of pedal travel or fading, and the wear is great. This combination of pads is also perfect for the spec Toyo RR tire used by the class. The SCCA (and SpeedSF) contingencies are a nice bonus as well! With G-Loc’s partnership, our SpeedSF drivers are able to focus their hard driving without worrying about brake fade, problems with braking modulation, and can consistently attack braking zones confidently. A huge thank you to Danny and Chris Puskar for developing industry-leading brakes that benefits motorsport racers and enthusiasts alike. For more information on G-Loc brakes, please visit www.g-locbrakes.com.